A chaos of color is what you will find in The Great Grammar Book. It is more heavy duty than your average book because it is filled with interactive tabs to pull, flaps to lift, and wheels to spin—a complicated undertaking, for sure. The book starts out with the parts of speech. Nouns are first with lift the flap to see things: stairs, door, fox, owl, etc. Nina Noun is a cat. Then come verbs, introduced by Vera Verb, a bunny. There’s a spinning wheel that shows: smile, jump, dive, sing, swim, leap, and fly. The wheel is problematic in that the words are upside-down at the top of the page and right-side up at the bottom. The sandcastle builders show present and past tense. The picnickers show conjugations of verbs. A boy throws a ball at a sleeping sunbather, and as the ball moves, the sunbather’s sleeping face changes to surprise. Adjectives are next, with Alan Adjective, a snake. This double-page spread shows a way to mix and match body parts (think head, body, and feet) to make some crazy animals. This page is the most fun one in the book. Children will delight in making a pink winged spiky animal or a pointed fat red one. Another wheel shows a red, striped, patterned, or spotted sheep. The next single spread shows adverbs with Annie Adverb, a worm. The author shows that the adverb describes how something is done in all six examples. She skips the fact that adverbs also answer where and when questions, too. Now for the trickier stuff. The author tackles pronouns with a single page spread and Percy Pronoun, the peacock. This page has a pull-out mirror—clever for me, you, him, her, we, us. The preposition page has Pipsqueak the dog hiding behind a gate. The page shows around the tree, through the hole, over the bridge, etc. The art pops up when you turn the page, pretty clever. The conjunctions page is less effective. Connie Conjunction is a mouse. Pull the tab and the words appear: or, and, but. The plurals page with Patrick Plural, the parrot, is a wall in an art gallery with flaps to lift and tabs to pull. Just when you think the book only does parts of speech, there is a possessives page. Six people walk into the lost and found (when the reader pulls the tab), and they all leave the kiosk with the things they lost. It’s clever and clear. The punctuation page has no animal tour guide but does have talking punctuation marks. There are no rules explained, just examples in a paragraph. The sentence page has a few parts of speech under flaps, which form a sentence at the bottom when all flaps are lifted. The book does some things well, and other things are glossed over without much explanation. However, the parts of speech are clear, and any teacher who wants to use this book in a lesson will be happy to own it. The flaps and wheels won’t hold up for long in a classroom, but if they could, the students might learn a little bit of grammar in a fun and engaging way. The author knows her stuff; the illustrator does the best she can with some of the abstract concepts of grammar. An A+ for effort and a B+ for execution. Every librarian will want one of these. 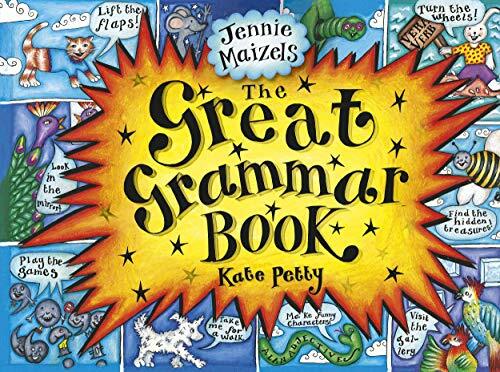 As long as kids use it with kid gloves, the book will survive for the next curious grammarian.